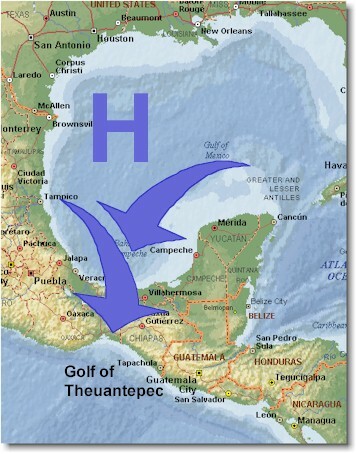 The next day, the port captain gave out a favorable weather report: 20 to 25 knots of wind and 3 to 6 feet seas: Our window to attempt the golf was there. The strategy asked to 'hug the coast' and stay along the 20 m depth line. That close to shore ('where you hear the dogs barking'), the sea does not have the chance to develop high waves. There still will be the wind, but the ride should be smoother. Half an hour later, Mike and I were gone, leaving Steve behind to wait for his crew David to return to the boat. We started in the same fashion as before: light winds, requiring the assistance of the engine. I had prepared a route with our GPS (the satellite based Global Positioning System) that would lead us the almost 300 miles along the coast. Around 9 o'clock at night we passed Salina Cruz (N15.53, W95.45), the last shelter before the golf. The winds were so light that I already saw us motoring the whole way, when suddenly the wind picked up and blew with 25 knots - out of nowhere! As if someone had opened a window, within a minute we found ourselves in moderate seas but stormy wind conditions. I did not have to wake Mike - he showed up on deck after almost being thrown out of his bunk. We shortened sails again and cruised at 5 to 6 knots through the darkness. Mike took the helm and had the biggest trouble avoiding running into one of the 30 fishing boats who apparently had decided to solely concentrate on the areas around our ship. I went to sleep, hearing the wind scream past sails and mast, feeling the boat dig into the seas, and lying mostly against the side of my bunk since we were leaning heavily. When I woke up again, the winds were gone and Mike had switched back to the engine. 'Rodeo Sailing' had only lasted for three hours while being exposed to the low lands of the golf. By now, the coast showed higher mountains again and the winds were gone. A smooth ride to our last port in Mexico, Puerto Madero (N14.43, W92.25), was to follow, offering only two more highlights: At around 10 in the morning, I spotted some unusual water formations and spraying in the air about a quarter mile a beam from us. We turned left and saw them after 5 minutes: 4 huge whales! Coming up to breath every minute or so they were heading south east. We were able to accompany them for almost one hour, keeping the boat along-side of them at their speed of 5 knots. Then, on a hidden command, we saw two tails and they were gone. We had seen other sea animals before. Dolphins were already regular visitors. running at us from behind, the racing the boat and staying around its bow, and finally diving away into the depth of the ocean. We also had seen sea turtles, flying fish and sea snakes, and, as a special highlight, a manta who used his huge wings to fade away after we had come along-side. Not too long after seeing the whales, a Mexican navy vessel approached us. The destroyer type ship positioned itself right next to us and asked us to stop. Five Minutes later, six soldiers with machine guns came over in a dingy. An officer and two of his men came aboard and assured us that this was just a routine check. 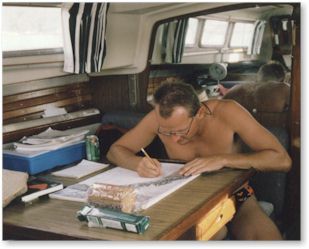 They inspected Mike's ship papers and our passports and took a look inside the cabin. Meanwhile, the dingy was waiting at a save distance - ready to come in for support if needed. Our conversation in a mix of English and Spanish was surely entertaining but satisfied the controlling officer. He left with his best wishes for our journey after only 10 minutes. We were truly amazed by the Mexican Navy. This had already been the second approach of a navy ship: On the third day out of San Diego, a vessel had tried to approach us but decided to abandon the exercise due to too heavy seas. Now, we had been checked at sea both when entering and leaving Mexico. Puerto Madero is located right next to the border to Guatemala. 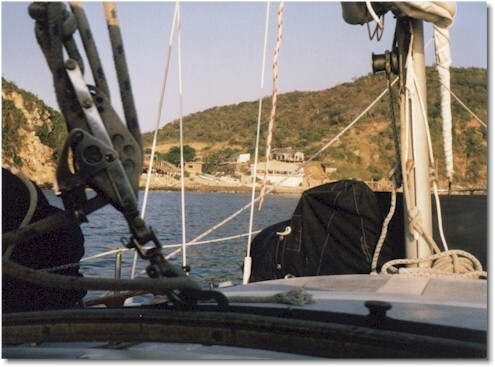 We came in late afternoon and were able to sail right to our anchorage without having to use the engine. 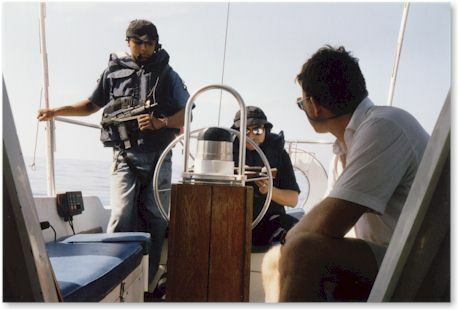 A fishing panga that approached us turned out to be a navy patrol unit and checked us in. The town that we reached on the back of a pick-up truck, very much looked like being out of the third-world: Dirt roads, poor neighborhoods, beaten up vehicles, and people living in huts. Depressing but with lots of atmosphere, and -best of all- friendly and smiling people.